Cover crops offer short-term benefits to the subsequent crop that include nitrogen provision, disease and insect suppression, soil moisture conservation, and weed suppression. Cover crop mulches have been used successfully in cotton production to help manage herbicide-resistant weeds in Georgia and throughout the Southeast. Cover crop biomass production is the key to achieving weed suppression with a cover crop mulch. Cereal rye is a popular cover crop choice for use in this system because it is capable of high biomass production. Cotton producers have also observed soil moisture conservation benefits and a reduction in thrips pressure when using a cereal rye cover crop mulch. 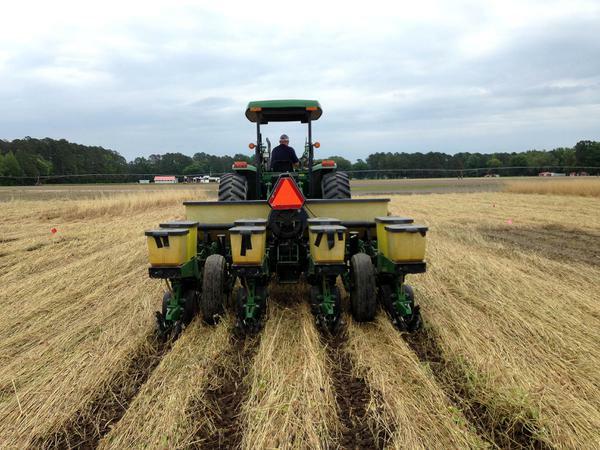 For these reasons, we investigated cover crop mulches and their benefits to cotton production in North Carolina. The objective of this study was to determine the effects of cover crop residue management at termination and cotton planting on cotton emergence, soil temperature, soil moisture, weed suppression, and cotton yield. Experiment Site: Studies were conducted from 2014 to 2016 at the Central Crops Research Station in Clayton, NC, the Peanut Belt Research Station in Lewiston, NC, and the Upper Coastal Plain Research Station in Rocky Mount, NC. All studies were conducted on a sandy loam or loamy sand soil. Cover crop: Cereal rye (variety: Wrens Abruzzi) and crimson clover (variety: AU Robin) were drilled together in mid-October. Cereal rye was seeded at 110 lb/acre and crimson clover at 10 lb/acre. The cover crops were terminated approximately one week before cotton planting using a roller-crimper (Figure 1) or a Gramoxone burndown at 4 pt/acre. Soft dough stage was targeted on the cereal rye for cover crop termination with the roller-crimper, which is typically reached in early to mid-May. 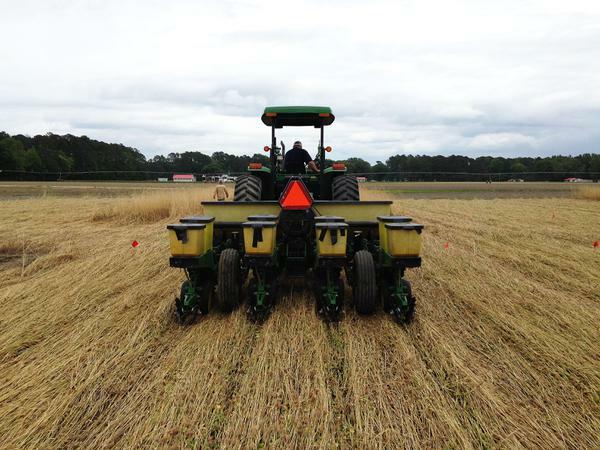 Cover crops were rolled perpendicular to cover crop drilling direction in order to maximize soil coverage. Cotton planting: Cotton (variety: ST 4946GLB2) was planted directly into the cover crop mulch in the direction it was rolled using a no-till planter equipped with Yetter shark-tooth residue managers and custom residue slicers attached to an added front toolbar to aid in planting into heavy residue cover crop mulches (Figure 2). Rolled cover crop that was fertilized in March with 30 lb N/acre to maximize cover crop biomass and with initial residue managers engaged at cotton planting (fertilized cover crop). Rolled cover crop with initial residue managers engaged at cotton planting (cover absent in-row, Figure 3). Rolled cover crop with initial residue managers not engaged at planting (cover present in-row, Figure 4). Standing cover crop terminated with Gramoxone and with initial residue managers engaged at cotton planting (standing, Figure 5). No cover crop (no-till planting into bare ground). Herbicides were used in combination with the cover crop mulch. Herbicides included a preemergence application of Cotoran (1.5 pt/acre) plus Reflex (12 oz/acre) plus Warrant (3 pt/acre) followed by one to two postemergence applications of Liberty (40 oz/acre) plus Roundup PowerMax (40 oz/acre). Collected data: Cotton emergence, soil temperature, soil moisture, weed coverage, weed biomass, and cotton yield. Figure 1. Roller-crimping a cereal rye and crimson clover cover crop mulch one week prior to cotton planting. Figure 2. 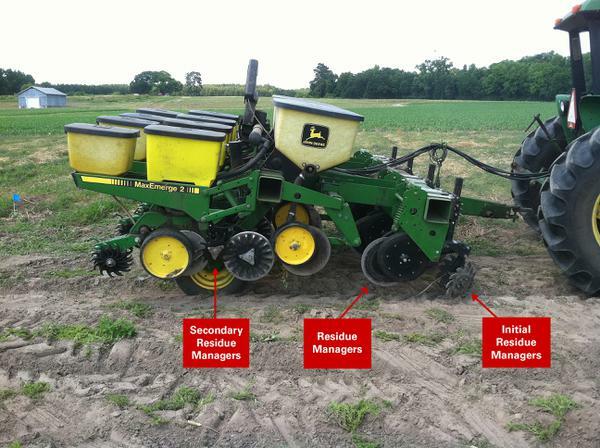 No-till planter with an added front toolbar to aid with planting into heavy residue cover crop mulches. Figure 3. Planting cotton into a roll-killed cereal rye and crimson clover cover crop mulch with the initial residue managers engaged at planting. Figure 4. Planting cotton into a roll-killed cereal rye and crimson clover cover crop mulch with the initial residue managers floated at planting. Figure 5. Planting cotton into a standing cereal rye and crimson clover cover crop that was killed via an herbicide burndown one week prior to cotton planting with initial residue managers engaged at planting. Cover crop: When the cover crop was not fertilized, cover crop biomass ranged from 3,400 to 5,890 lb/acre across our experiment sites (Table 1). Fertilizing the cover crop enhanced cover crop biomass production from 220 to 1,180 lb/acre, depending on experiment site. AU Robin is an early flowering crimson clover variety, and it produced hard seed prior to termination which led to both summer and fall volunteer crimson clover growth. The preemergence herbicides applied at cotton planting did an excellent job controlling the summer volunteer crimson clover. Fall volunteer crimson clover appeared unaffected by herbicide use during the cotton season, and a full crimson clover stand was present at cotton harvest (Figure 6). This fall volunteer crimson clover did not interfere with cotton harvest. Letting your crimson clover go to hard seed prior to termination can be used as a cost-saving mechanism for cover crop seeding. Table 1. Unfertilized and fertilized cover crop dry biomass by environment. Cotton emergence: Cotton emergence declined when cotton was planted directly into standing cover crop and when the residue managers were floated at cotton planting thereby, leaving the cover crop present in-row (Figure 7). When the cover crop was rolled and the residue managers were engaged at cotton planting, cotton emergence was similar to cotton planted into bare ground. Soil temperature and moisture: Soil temperature was always reduced by the presence of a cover crop (Figure 8), regardless of cover crop residue management strategy. Reduced soil temperature could affect cotton emergence and intensify seedling diseases. Regardless of cover crop residue management strategy, the presence of a cover crop always enhanced soil moisture availability (Figure 9). We were especially surprised to see similar soil moisture conservation benefits when cotton was planted into a standing cover crop compared to a rolled cover crop. These results indicate that producers that do not have a roller may be able to reap the soil moisture conservation benefits of a cover crop by planting into a standing cover crop. Weed dynamics: Using herbicides in combination with the cover crop mulch provided excellent weed suppression. Concern has been expressed about preemergence herbicides binding up in cover crop residue and not reaching the soil; however, preemergence herbicides applied to our cover crop mulch in this study provided great control. Further work is merited to determine which herbicides may be more prone to tie-up in cover crop residues. The cover crop biomass levels achieved in this study did not provide adequate weed control in the absence of herbicide use. Cotton yield: Cover crop residue management did not affect cotton lint yield at four of the five experiment sites in this study. Irrigation was used in these studies when moisture was limited, which may explain lack of yield differences between a cover crop and no cover crop despite enhanced soil moisture availability under a cover crop mulch. These results also indicate that despite reduced cotton emergence when cotton was planted into standing cover crop or rolled cover crop that remained present in the cotton row, cotton could compensate in yield for this reduced emergence. Figure 7. 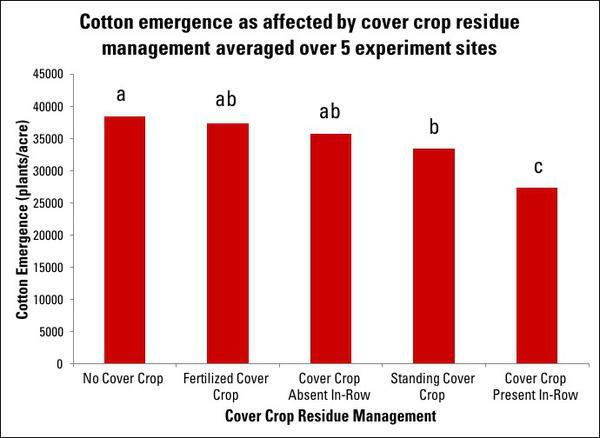 Cotton emergence as affected by cover crop residue management averaged over five experiment sites. Figure 8. 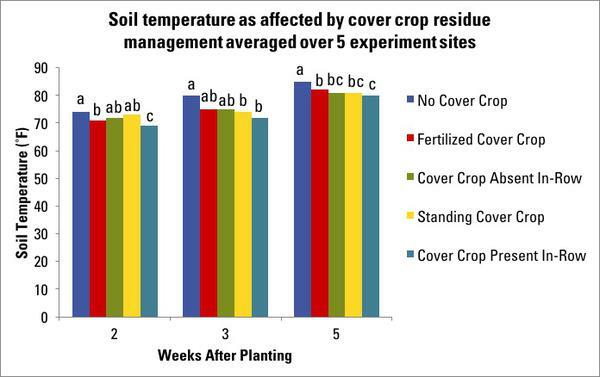 Soil temperature as affected by cover crop residue management averaged over five experiment sites. Figure 9. 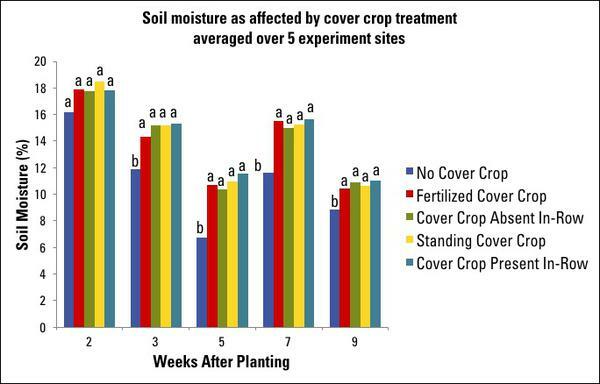 Soil moisture as affected by cover crop residue management averaged over five experiment sites. When herbicides were used in combination with the cover crop mulch, excellent weed suppression was observed across all cover crop residue management strategies. Results from this experiment indicate that cotton producers have flexibility in cover crop residue management at termination and cotton planting to reap the benefits of soil moisture conservation without adversely affecting weed suppression or cotton lint yield. A big thank you goes to the North Carolina Cotton Producers Association for supporting this research. 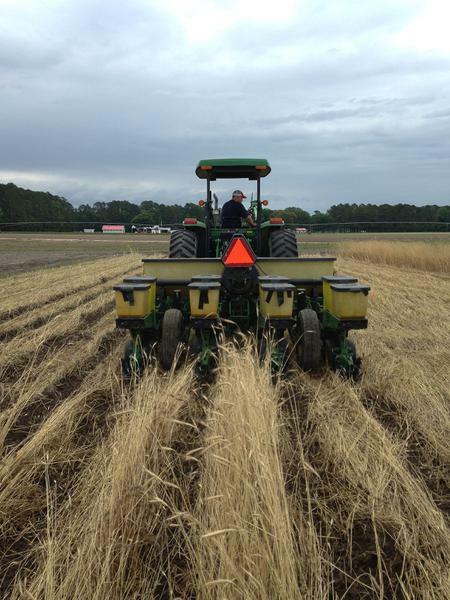 We are excited about the future of cover crop use in cotton production in North Carolina! Questions? Contact Rachel Atwell Vann for more information.